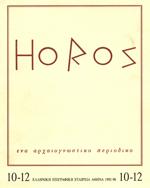 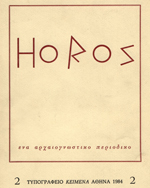 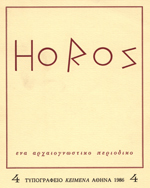 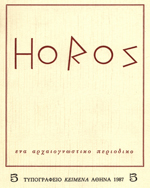 HOPOΣ (Horos) journal was established in 1982 by A. P. Matthaiou, Y. 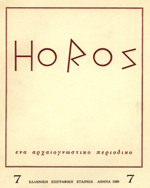 A. Pikoulas and A. N. Tsaravopoulos. 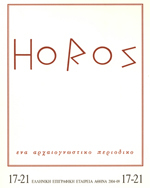 P. Valavanis also took part in the initial discussions. 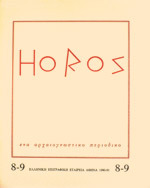 In 1984 V. N. Bardani became a member of the editorial board. 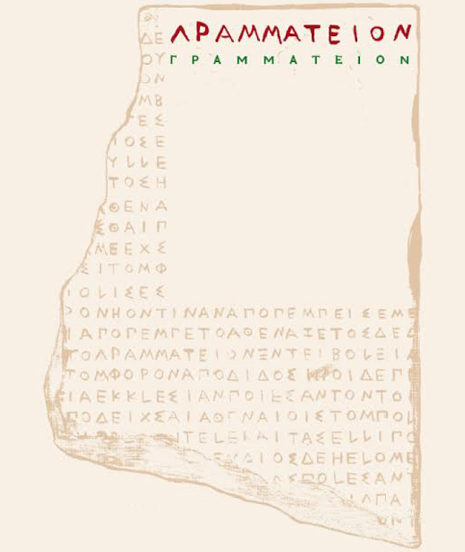 • The publication of ancient Greek inscriptions and epigraphic studies so as to promote the study of Greek inscriptions in Greece. 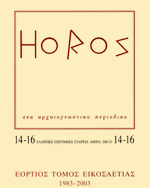 • The publication of studies related to the historical topography of the Ancient Greek World. 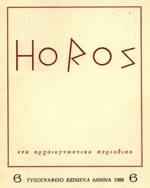 The publication of HOPOΣ would have been very difficult, if not impossible, if it were not for the contribution of the late Philippos Vlachos (1939-1989), expert typographer and publisher of “Κείμενα” and that of his collaborator Georgia Papageorgiou. 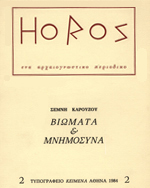 Their constant support, enthusiasm and expertise was invaluable for the printing of the first 6 volumes of the journal [1 (1983)-6 (1988)] which came out in the series “Κείμενα”. 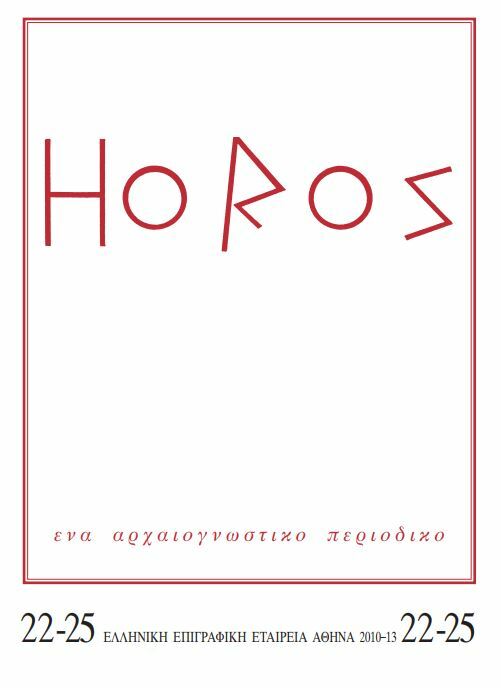 During our collaboration with Vlachos’ team and his publishing house we had the opportunity to become familiar with the admirable art of traditional printing methods and its experts. 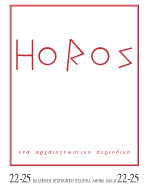 After Vlachos’ death, the editorial board turned to more technologically advanced methods for the printing of the journal and the publication of HOPOΣ was operated by the Greek Epigraphic Society. 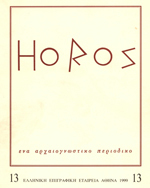 This decision was based on the fact that its editorial board happened also to be among the founding members of the Greek Epigraphic Society and that its objectives coincided with those of HOPOΣ. 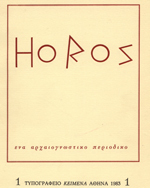 It is characteristic that, from its fourth volume onwards (4, 1986) the journal comprised, apart from the scholarly articles, also the annual report of the Greek Epigraphic Society. 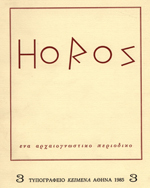 From volume 7 (1989) onwards HOPOΣ has become the journal of the Greek Epigraphic Society, directed by its initial editorial board.